Space for our Young Adult library users! Farewell and thanks for a fun summer! As I wait for our "stuff" to arrive here, I've been spending time, you guessed it, at the local library. I've been spending my free time reading a lot. Here's what I've been reading and my reaction to it. This is a fun take on the classic, Alice in Wonderland. Alice is actually a princess, heir to the throne of Wonderland. But her parents are murdered by her evil Aunt Redd. Alice must escape into our mundane world where her memories are treated as delusions by those around her. Eventually she gets back to Wonderland to battle Redd for the throne. Now I understand what all the hype is about for this series! The Hunger Games is the first book in a trilogy. (The final, Mockingjay was just released last month.) All three are available at the Brussels Library. When I first read the description, I wasn't sure I'd enjoy the book. But it really is fantastic! I can't wait for the copy of Catching Fire that I requested to arrive! Yes, I know the title sounds odd. But this book is a lot of fun. It's good enough that a school district in Missouri has banned it. It sounds like it was written by a teen-age boy. No wonder somebody was offended! Seriously, it's a good read and well worth an ILL request. It's a graphic novel that has been fun so far. I'll let you know what I think once I've finished. Meanwhile, I'd love to hear what you're reading! As I prepare to leave Brussels, I wanted to thank all of you who participated in the Brussels Library Teen Program (even if the CYSS made you come). I hope you had as much fun as I did. Please continue to use this site and the Animoto account! I will try to keep posting things I think might interest you as soon as I get settled. Please use the comment box or discussion box to send me messages or suggest things I could include. 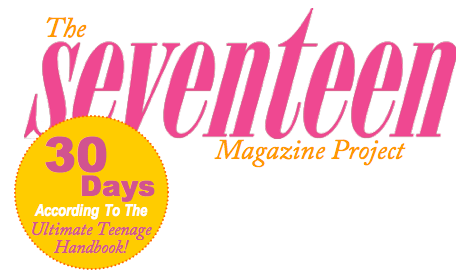 Follow Jamie Keiles as she attempts to live one month "according to the gospel of Seventeen Magazine." Teenagerie noun 1: a collective set of media representations defining society's understanding of the exotic condition known as adolescence. 2: a blog meant to analyze, deconstruct, and promote discussion centered around these representations. Be sure to check my link on the bottom to information on how to evaluate the quality and accuracy of websites! My educator's account has come through so you can use this code and your email address to sign up for FREE All Access accounts that will last for six months! 3. Enter the rest of the information in the signup form (e.g. name, birthday, etc). Once all that data is entered, click on "Sign Up" and get All Access! If you are under 13, it won't let you sign up yourself. Send moc.liamg|ca4liambil#!em liame or post a comment here and we'll set up a special account for you. Use this animoto code to make your Book Review Trailers and post the URL address here in the comments or on the Book Recommendations page! To give you an idea of what you can do, here's my rather lame experiment. Have fun with this! Just be sure to share!